A 23-year-old man has been shot by police during a house raid involving 250 officers carried out early on Friday under the Terrorism Act. 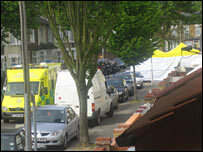 The man, who was later arrested, was taken to hospital after the search in Forest Gate, east London. His injuries are not life-threatening. A 20-year-old man is also being held at a central London police station. A single shot was fired, according to the Independent Police Complaints Commission, which will investigate. The operation was not linked to the London bombings of July 2005, police have said. Deputy Assistant Commissioner Peter Clarke, head of the Met's anti-terror branch, said the operation was planned in response to "specific intelligence". "Because of the very specific nature of the intelligence we planned an operation that was designed to mitigate any threat to the public either from firearms or from hazardous substances," he said. He said the purpose of the raid was to prove or disprove intelligence they had received. BBC home affairs correspondent Daniel Sandford described it as the most significant anti-terror operation this year. The 23-year-old man was arrested on suspicion of the commission, preparation and instigation of acts of terrorism as he was being treated at the Royal London hospital. The 20-year-old man was being questioned at Paddington Green police station. Police officers in protective clothing have moved into the terraced house in Lansdown Road in what is being described as a "precautionary measure". The search of the premises is expected to take several days. A white and yellow tent has been set up outside the property, while workmen are erecting a two-storey high scaffolding screen around the building. Several people in the house at the time of the raid have been moved to other premises. They have not been arrested. Lansdown Road, and neighbouring Rothsay Road and Prestbury Road, are all closed. 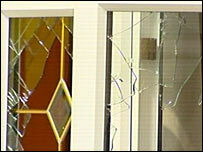 A 14-year-old boy Nimesh Patel, who saw the raid, said police broke in through a window, and then opened the front door. He said the person shot appeared to have a shoulder injury. Another witness said he had seen a man wearing a bloodstained T-shirt being carried out of the house after the raid. Meanwhile, a group of around 20 Asian men have gathered outside the gates of the Royal London hospital to protest at what they believe was heavy handed treatment by the police in the raid. BBC home affairs correspondent Danny Shaw said the raids follow an investigation into international terrorism targeting the UK. Security sources have described the Forest Gate raid as "potentially significant" and said it followed months of surveillance. The raid followed discussions between MI5, the Met's anti-terrorist branch and the Health Protection Agency - which advised on the potential health risks of the raid. The IPCC, in a statement, said it would use its own investigators to "examine the circumstances surrounding the discharge of a police firearm". Deborah Glass, IPCC commissioner, said: "The incident was referred to the IPCC immediately and investigators were deployed to the scene. "An examination of the officers' firearms confirms that a single shot was discharged in circumstances that are currently under investigation." The Civil Aviation Authority says an air exclusion zone has been set up over east London and will be in place for four days. Aircraft are banned from flying over the site below 2,500ft. Residents said Forest Gate was a typical east London "mixed" community with a large number of Bengali and Pakistani families, along with a recent influx of Eastern Europeans. One neighbour said the operation early this morning had involved "the most police I've seen in my life". Another neighbour said a family lived at the address. "They were respectable and nice people and we do not know anything else. They have always been nice to us," she said. "They have lived there for a long time. The kids all go to school locally." Have you been affected by this story? Are you in the area? Send us your comments and experiences. You can send pictures and video to yourpics@bbc.co.uk or text them to 07725 100 100.